Madeline and AJ Reed met while riding the bus to school. Her Dad, Hoyt Mingle, was the bus driver and wanted his daughter, Madeline, to ride with him to high school in Woodbury, TN. Part of the bus route included Porterfield Road where a young man nicknamed "Blue" (AJ Reed) lived. Unbeknownst to Dad, this stop set up the meeting of his daughter and her future husband. AJ and his friend, Austin Elrod, saved a seat for Madeline (nicknamed "Red") every day on the bus. At first she thought Austin was her suitor, but she soon discovered that AJ was the one that had his eye on her. 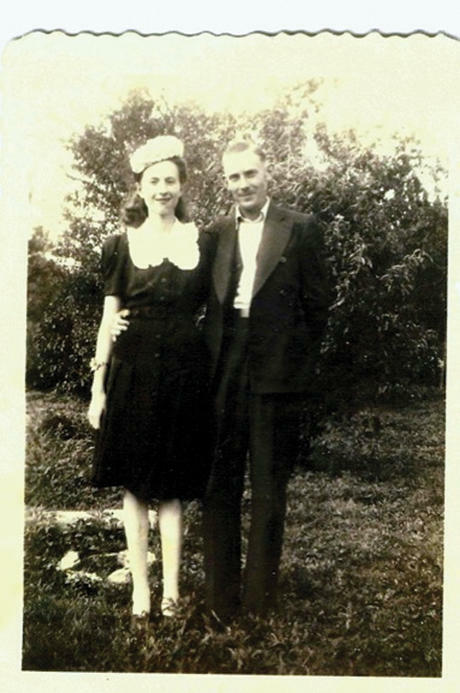 Their budding romance began in 1942. James Fann drove them across the border to Georgia where they could be married. They returned home that night to her Mom and Dad's home. During the war, AJ and Madeline toured through Ft. Campbell, TN, Ft. Mead, GA, Ft. Bliss, TX, and California before AJ left on an aircraft carrier for the Phillipines. Madeline said, "they would not let me go with him." He was on an aircraft carrier sitting next to the USS Missouri when the peace accord was signed. Later in Japan he had the auspicious duty of safe guarding Tokyo Rose. Madeline was busy during the war years also. Judy was born in 1944 and Gerald in 1945. They tell a story about a time when they were traveling between two assignments and threw a smelly diaper out the window and AJ's sergeant stopped to pick it up. What Fun! AJ was not able to be present at the birth of his children until 1947 when Patricia was born. AJ was discharged from the Army in 1947. They returned to Tennessee for a few years and farmed with family. In 1950, Madeline and AJ moved to Illinois with their three children and soon added two more, Barbara and Terry. AJ worked at Caterpillar Tractor Company and Madeline was a homemaker, sales manager, and outside sales rep in the decorating division. She worked for both Sears and Montgomery Ward. AJ lost his right leg in an accident at Caterpillar but continued to work for 25 years until he took medical disability in 1978. AJ pastored New Lebanon Baptist Church and provided interim ministry to many others. They attended Liberty Baptist Church until Madeline's retirement in 1988 and their move to Caryle, IL by the lake. They purchased a RV and travelled with the Southern Baptist Mission Service Corp to help new churches-even one in Alaska. They also spent winters in south Texas and travelled to Mexico on mission trips. In 2008, they returned to Tennessee to be closer to their roots and their youngest daughter, Barbara. They are residents of the Sycamores Terrace Retirement Center where they enjoy all of their new friends. They also enjoy traveling back to all of the "hollers" of their youth around Woodbury. Madeline and AJ celebrated their 50th anniversary with a renewal of their vows complete with wedding dress, flowers, cake, and three daughters as Maids of Honor and two sons as Best Men. The entire Reed clan participated in the affair. For their 70th anniversary family and friends celebrated at the Sycamores Terrace on Saturday, May 18th. A reception was held at 2 pm in the dining room. Please rejoice with Madeline and AJ as they celebrate their life together for 70 years!